We all write pieces at times that we are proud of and want to share on our blogs. To do that, we have to retype or copy and paste. Some programs copy and paste better than others. Today we tried copying from a Google Doc and putting it into our blog and disaster struck! Look at this crazy code that barreled its way into Melissa’s blog post. Yeah, whatever! Most of the 7th and 8th graders can relate to this mess! 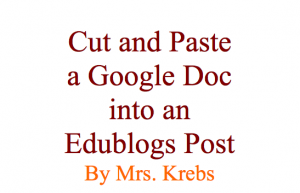 Here are step-by-step directions to take the writing you have composed on Google Docs and bring it cleanly into Edublogs. First, copy the work. 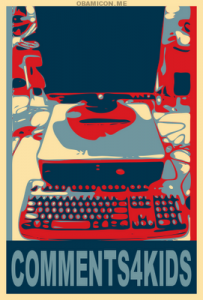 Use Command-C (Control-C on PCs) Remember: Don’t copy the heading because we don’t publish that on our blog posts. 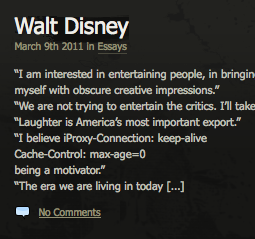 Next, come to your blog Dashboard and Add New post. Then under Visual view, click the colorful button on the far right. It’s called the kitchen sink. About in the middle of the lower toolbar is a button with a T for text–plain text, that is. This “Paste as Plain Text” button is what you need. Click and then Command-V (or Control-V for PCs) and your text will go in. Then click Insert. Make any extra formatting you wish. Maybe some bolded headings or color changes. Now in either Visual or HTML, it won’t have all that extra crazy code that gave us fits when we tried to paste it directly into the post. Going through that one extra step will keep this post having the same nice formatting as all your other blog posts! If you’d rather watch me do it, I’ve made a video showing the steps on my desktop. Great directions! I’ve just started a class blog with my 4th graders and they’ve begun their blogging days with commenting on other blogs. I hope to get to having them post very soon. How do you participate in Comments4Kids? I participate in Comment4Kids very simply. I just put the hashtag #comments4kids on a Tweet when I want to get comments on new blog posts. I’ll retweet one with your attention. I also follow the tag on my Tweet Deck and try to visit a few blogs about every other day. It’s very rewarding seeing my students’ reaction and anticipating that other students around the world are learning and excited about my comments. I’ve also found classes to collaborate with using comments4kids. Then my students go and comment on other students’ too. I have some of the classes we are commenting on in a blog roll called “Cool Classes.” Hope that helps. I have another Screencast that might be helpful for your bloggers too. I’ll send that your way too. That’s great! My students aren’t posting yet, just commenting, but they enjoy reading replies from their comments and our blog. I’ll remember #comments4kids once we get going! Thanks for the screencast as well – I’m not sure what that is, but I appreciate your help! Thank you for being my guest commentator. My name is Kayle.